Royal Air Force drones and jets have dropped more than 3,400 bombs and missiles on Islamic State (IS) militants in Iraq and Syria, an investigation by Middle East Eye has revealed, yet the British government maintains that there is “no evidence” they have killed a single civilian. Islamic State regularly used “human shields” in built-up areas, but despite this and the scale of the ordnance dropped by the RAF, the MoD maintains it has “no evidence” that its strikes have caused any civilian casualties – a position now roundly rejected by defence analysts and opposition parties. “Our armed forces are among the best in the world, so they will be among the most discerning and accurate when it comes to targeting,” Liberal Democrat leader Vince Cable, told MEE. The US Air Force, which leads the anti-Islamic State coalition, says it has caused 786 civilians deaths in the three-year air war, but despite saying the air war is the “most challenging fight in decades”, the RAF has made so such assessment. Earlier this month, the minister of state for the British armed forces, Mark Lancaster, told parliament that the government “had been able to discount RAF involvement in any civilian casualties”. The RAF says it takes all steps to minimise civilian casualties, but it has conducted more than 1,600 strikes in Iraq and Syria – more than any other coalition country except the US. “The UK’s claim that no British air strikes in Iraq or Syria have led to civilian deaths has always been difficult to believe. “Based on the coalition’s own civilian casualty reporting, it is extremely unlikely that a coalition member as active as the UK would have not had a hand in a single civilian death. “Turning a blind eye to the consequences of air strikes and pretending they are somehow now ‘risk free’ is naive in the extreme,” said Chris Cole, director of campaign Drone Wars UK. 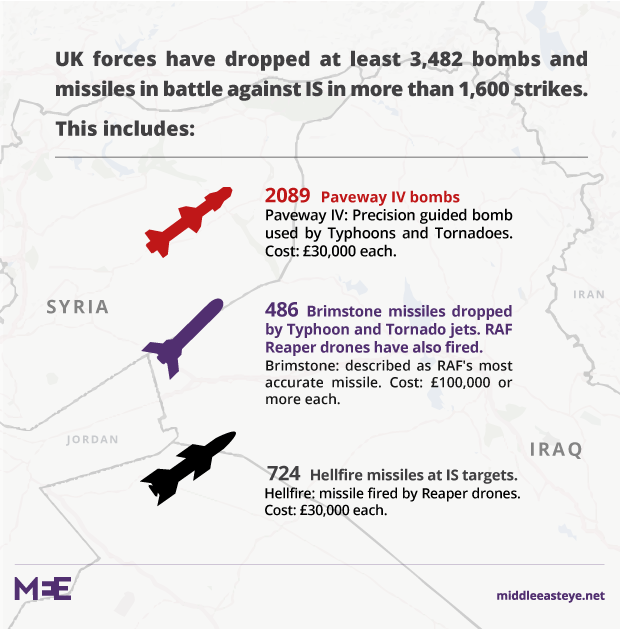 MEE’s analysis shows that during the fight for the Iraqi city, RAF Typhoons and Tornadoes dropped dozens of Paveway IV bombs on IS fighters in the city. The RAF says it takes “all possible precautions to avoid civilian casualties”, but Amnesty International has previously expressed serious concerns about the air war’s toll on civilians. In a report earlier this year, it found the battle for West Mosul had caused a “civilian catastrophe”. Civilians were being ruthlessly exploited by IS, which had moved them into conflict zones, used them as human shields, and prevented escape. 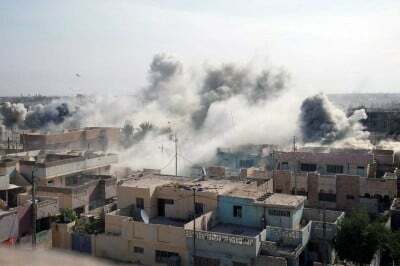 They were also being subjected to “relentless and unlawful attacks” by Iraqi forces and the US-led coalition. The source added that all missions were “meticulously planned” and there was no suggestion that UK forces have committed war crimes. However, there are fears that by failing to fully address the issue of civilian casualties, the MoD is not presenting the full picture of Britain’s campaign against IS. “If the RAF can claim zero civilian casualties, then the argument for more air strikes stands. “Only by defeating Daesh for good will we reduce the threat to us here at home. British forces have crippled Daesh since 2014 and the RAF will continue to strike the terrorists hard where they plan their campaign of hate in both Syria and Iraq. “We have no evidence that RAF strikes have caused civilian casualties. “We recognise the challenge faced by coalition pilots in close urban fighting against a ruthless terrorist enemy that uses civilians as human shields, but are clear that to do nothing would leave cities in the hands of Daesh brutality.